On the 5th of November of 1947 a baby lowland gorilla, stolen from his home and family in West Africa, arrived at the London Zoo. As it was Guy Fawkes day, this newest prisoner was named in his honor. 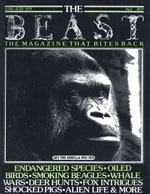 Guy the Gorilla went on to become one of the biggest money makers for his captors, and thousands of visitors would gawk at him, occasionally throwing him sweets to eat. Eventually the candies rotted his teeth, and during a surgery to repair them, he had a heart attack. The budding animal liberation movement in the UK took notice, and a group of people began producing buttons with Guy’s face on them. 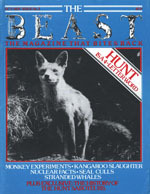 As the buttons grew in popularity, this small group decided to make a newspaper, and soon The Beast became an insert in International Times. After two such inserts the editors struck out on their own, and soon this beautiful publication was on newsstand racks in England and abroad. 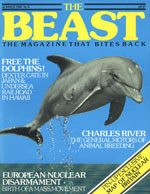 It was produced for two short years, and remains one of the best animal liberation (and anti-nuke!) publications of all time. 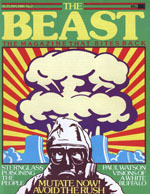 The Beast began it’s run during a time of global social and political decay. As the voters of the west fell under the spell of charismatic and brutal conservatives, a broad coalition of anti-nuke, anti-fascist, union, conservationist, environmentalist, and animal lib activists entrenched themselves to fight back. 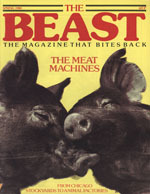 As things “hotted up” in the streets, the staff of the magazine followed the action and ideas of an astonishing number of people and groups. The tone in the early issues is optimistic, brave, and intelligent, and offers a fascinating glimpse into the psyche of activists during the era. The history covered is equally incredible. 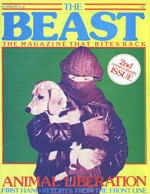 Articles offer the story of the first animal liberation raid in the United States, the origins of the Hunt Saboteurs Association, and the early days of the Animal Liberation Front. 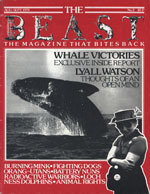 Lost figures, like OG U.S. Hunt Sab and eco-prisoner John Walker, come back to life in these old pages. 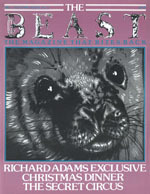 Important thinkers, such as Henry Spira, Peter Singer, Richard Adams, and Paul Watson were regular contributors. Then, there are the images! Between the full color, glossy covers are amazing pictures of early raids, movement legends, and epic moments on our movement’s timeline. 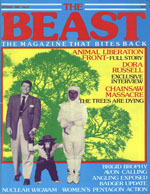 One such photograph, taken in 1980 and shown in issue #10, captures a small group of Animal Liberation League activists standing with banners in a field, bandannas covering their faces, fists in the air. 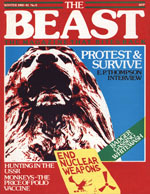 More than 30 years later young people still show that same spark of rebellion and hope, and with our archiving of this magazine, perhaps they will now better understand the revolutionaries who came before them.